Scared to eat oats? I totally understand. Oats are inherently gluten-free, but due to most farming methods and processing the high risk of cross-contamination put them on the forbidden list. But over time, everyone gluten-free around me seemed to be eating oats. They appeared in more and more unregulated gluten-free products, and some nutritionists were even encouraging people to eat more oats to compensate for the lack of fiber in a gluten-free diet. Well, I tried to eat regular oats once, and it felt like little razor blades were rolling around in my stomach. I avoided oats for years. Then someone got the bright idea to start farming oat crops, known as purity oats, that are strictly used for only oats and surrounding gluten-free crops. In theory, it made sense that this would eliminate contamination. A couple of years ago I tried oats again. I was really scared, but these pure gluten-free oats were easy to find and I was ready to take a chance. I was so excited when the certified gluten-free oats didn’t give me any reactions! But I still meet people that say oats, even the supposedly gluten-free ones, seem to bother them. This could be due to the relative newness of gluten-free regulations and gluten-free testing methods. 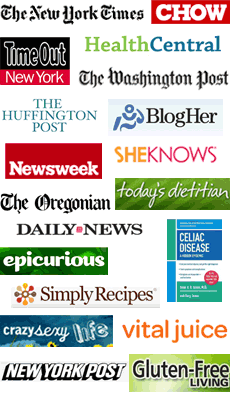 It’s a complicated topic, if you’d like to read more I highly recommend following Gluten Free Watchdog. 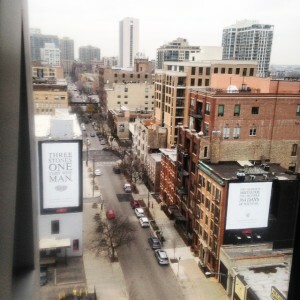 Last week I found myself in Chicago for a gluten-free blogger summit hosted by Quaker Oats. 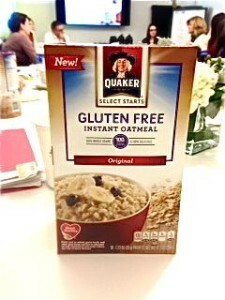 Ten of us were seated around a conference room table and given an “oatucation” (har har) about the milling industry, Quaker’s nearly 140 years of oat expertise, and the details about their breakthrough milling process to sort the oats, high-tech processing, and rigorous testing methods. 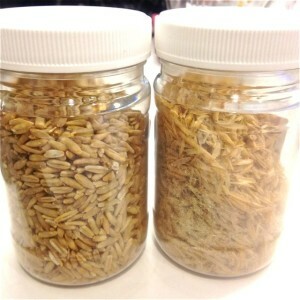 Just for fun, here’s a photo (left) of oat groats and the outer layer or “coats” that are removed before we eat them. The groats are on the left and the “coats” are on the right. All of us were a bit skeptical due to our mama bear instincts to protect our readers. 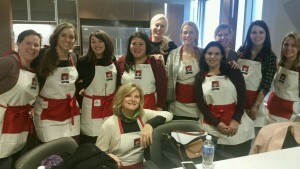 And this group of bloggers also included two editors from gluten-free magazines, so they were especially jumpy. Of course, in the world of mass food production, many things can happen. But several things convinced me that Quaker’s gluten-free oats are safe. I believe that they don’t want to put their trusted reputation at risk after building it for the last 140 years. They’ve been receiving calls asking for gluten-free products for years, but they have taken their time to develop them in a safe way. They were very clear that it wasn’t easy. One of the many checks and balances within the production they came up with is the use of a single kernel inspection machine. As part of their inspection system, this machine uses near-infrared technology to single out any gluten containing grains that may have snuck in early on in the sorting. They have Lori Alexander on the team. Lori has celiac disease. She’s served on the Board of Directors for the Canadian Celiac Association. She’s one of us!!!! Previously, Lori held a role in the Nutrition Science and Regulatory Affairs department of PepsiCo Canada, where she solidified her expertise in international allergen regulations, school nutritional guidelines and governmental advocacy. While in Canada she was also appointed as the youngest member to serve on the Board of Directors for the Canadian Celiac Association. Prior to PepsiCo, Lori was a department lead at the Guelph Food Technology Centre, a world renowned food science institute. She holds a Master of Science in Human Biology and Nutritional Sciences and Honors Bachelor of Science in Nutrition and Nutraceutical Sciences from the University of Guelph in Canada. I could go on and on, but those were the clinchers for me. I’m also really excited about the price point for these products. They are almost half the price at Walmart and Target than the gluten-free oats I’ve been buying. I’m happy that gluten-free families on a budget can now save money and at the same time eat a healthy food that can be used in so many ways. Want to read more about gluten-free oats? Here are the other gluten-free bloggers that met up with me in Chicago. 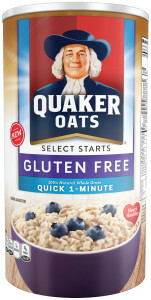 And here is what Gluten-Free Watchdog has to say about Quaker Gluten-Free Oats processing. With that said, I advise each person to use their best judgment when deciding whether or not to try Quaker’s gluten-free products. I have presented the facts as they were presented to me, and I hope they help you make the right decision for yourself and your family. *This post was sponsored by Quaker Oats. All opinions are my own. 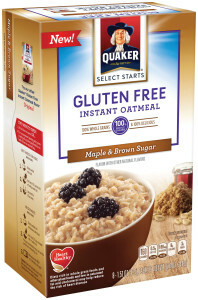 Do they make non-instant Gluten free oats? Thanks for starting up again-hope you are well!